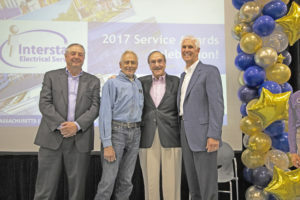 On July 20, Interstate Electric Services hosted a service awards event at their operations center at 515 Woburn St., Tewksbury. A highlight of the annual event was the celebration of their first employee’s 50th anniversary. Domenic Inferrera first joined the company in 1967 to help then president and founder Pat Alibrandi with a major project. Today, Inferrera works at the operations center, a full service prefab shop for off-site electrical component assembly. Interstate is headquartered in Billerica and has offices in Connecticut, Maine, New Hampshire, Rhode Island and Vermont. The company employs more than 600 employees and provides electrical construction, design/build and electrical services to commercial customers of all sizes.